Cavernous hemangioma. Paranasal sinuses. Epistaxis. Introduction: The hemangioma are congenital benign lesions relatively common and that happen predominantly in head's and neck area. Although common, they happen infrequently in the paranasal sinuses. Objective: Report a case of cavernous hemangioma of maxilar sinus. Case: ACM, 33 years, male, whith history of epistaxis for 02 weeks. After diagnosis procedures he did refer to surgery that have a diagnosis of cavernous hemangioma of maxilar sinus. He get success whith excelent evolution. Conclusion: The treatment not always is necessary to depend on the histological type. When is need, the treatment is surgical. We report a case of cavernous hemangioma of maxilar sinus. Hemangiomas are benign congenital tumors relatively common, often affecting the head and neck area and hardly affecting paranasal sinuses. They origin is uncertain. There are two histological types of hemangiomas according to the microscopic size of the blood vessels. 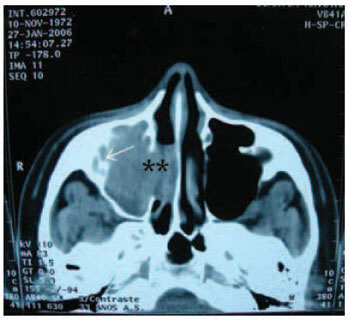 This study reports a case of cavernous hemangioma on maxillary sinus. A 33-year-old-male patient, presenting epistaxis (nose bleeding) to the right, for 2 (two) weeks. He had been to other service, where he underwent to anteroposterior unilateral nasal packing for 48 hours. He presented improvement and was sent to ambulatory analysis. 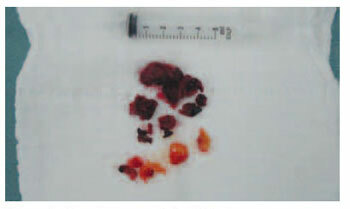 He did not report nasofibroscopy, but reported bleeding two days later after having applied at INOOA for follow-up. The patient underwent a nasalfibroscopy exam, which presented polyps in the right medium meatus and also bulging of lateral wall at the same side. Face CT scan with widening of OMC (ostiomeatal complex) with complete covering of right maxillary sinus with no bone erosion (Pictures 1, 2). The patient has been forwarded to FESS (functional endoscopic sinus surgery), and during the surgery, a darken material with necrotic aspect has been observed inside the maxillary sinus (Picture 3). An external access has been performed through Neuwmann incision in order to better check the cavity. The result of the anatomopathologic study has revealed Cavernous Hemangioma. The patient has presented a good post-surgical evolution and no significant bleeding has been observed during the surgery. Picture 1. Paranasal Sinus CT - Coronal cut - complete covering of right maxillary sinus with no bone erosion. ** Widening of ostiomeatal complex. Picture 3. Macroscopic aspect of the lesion. Hemangiomas are benign and congenital lesions on the skin and mucosas, and are relatively common. They often occur in the neck and head area, and together with the lymphangiomas count for 30% of oral tumors in children(1,2). Although their origin is questionable, hemangiomas are histologically classified into two types: capillary and cavernous, depending on the prevailing microscopic size of the vessels(3). Although hemangiomas can be frequently seen in the neck and head areas, they hardly occur in the paranasal sinuses(3). Most of hemangiomas placed in the nasal vestibule and septum they are capillary type. Yet, the ones placed in the paranasal sinuses are usually cavernous type(4). Hamangiomas in the paranasal sinuses are quite rare and it is difficult to precise their origin site. They originate from lateral wall of nasal cavity or from the middle wall of paranasal sinus. Clinical condition will depend on the site and size of lesion. The main clinical features are: persistent epistaxis and nasal obstruction. Capillary hemangiomas can be asymptomatic or when affecting the nose, they are called "bleeding polyps". These ones can present either as a red polypoid lesion or sessile nodular mass of progressive enlargement, causing nasal obstruction or epistaxis at any trauma(1). Opposing to that, cavernous hemangiomas are baldy defined lesions regarding depth and are usually subcutaneous. The current patient presented recent repetitive epistaxis, though did not present nasal obstruction or any other correlated symptoms. Radiological findings usually present common alterations to benign lesion on imaging exams. Paranasal Sinus Hemangiomas are meant to be the cause of alterations on adjacent bone(3,5). Therefore, cases of bone destruction caused by paranasal sinus hemangiomas have been reported, and their diagnosis can be misunderstood with malignant lesion. In these cases, clinical history of epistaxis and nasal obstruction can help diagnosing. The radiological findings from the reported case follow the standard of benign alterations, with no bone erosion and with alteration only on mass effect with ostiomeatal complex widening of the side of lesion. Cavernous Hemangioma therapy means patient should go under surgery, when necessary. Capillary hemangiomas recede spontaneously by aging. Its removal is only necessary in cases of bleeding and discomfort. Pre operative angiography and embolization are important in surgical cases, though surgery or even biopsy might result great amount of blood loss. In the current case, fortunately, surgery did not present expressive bleeding. Kim et al. (3), also presented two cases where surgery did not present high bleeding, though this reflects to a non- or low artery circulation in our cases. According to Pasquini et al, endoscopy approach has been successful to resection of benign tumors such as angiofibromas and hemagiomas(6). 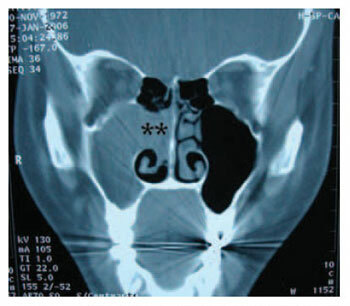 For the current case, combined approach was chosen in order to better visualize the interior of maxillary sinus. There was no nasal packing, and patient was released from hospital 24 hours after surgery and has been under follow-up and considerably improving even regarding symptoms. 1. Stamm, AC; Watashi, C.H; Pozzobon, M. Microcirurgia dos Tumores Benignos Naso-sinusais. En. Stamm, AC. Microcirurgia Naso-sinusal. 1a ed. Rio de Janeiro: Revinter; 1995, 359-60. 2. Cummings, C.W., Fredrickson, J.M., Harker, L.A., Krause, C.J., Richardson, M.A. ; Schuller, D.E. Otolaryngology - Head and Neck Surgery, 3a ed. St. Louis: Mosby,1998. 3. Kim, H; Kim, JH; Kim, JH; Hwang, EG. Bone Erosion Caused by Sinonasal Cavernous Hemangioma: CT Findins in Two Patients. AJNR, 1995,16: 1176-78. 4. Som, PM; Bergeron, RT. Sinonasal cavity. Head and Neck Imaging, 1991, 230: 51-276. 5. Most, DS. Hemangioma of the maxillary sinus. Oral Surg Oral Med Oral Pathol, 1985, 60: 485-486. 6. Pasquini, E; Sciarreta, V; Frank, G; Cantaroni, C; Modugno, GC; Mazzatenta, D; Farneti, G. Endoscopic treatment of benign tumors of the nose and paranasal sinuses. Otolaryngology-Head and Neck Surgery, 2004, 131(3), 565-7. 1. ENT doctor by ABORL-CCF - Associated ENT Doctor at INOOA - Preceptor Assistant of ENT Training Program at INOOA. 3. ENT doctor by SBORL - Head of ENT Department at INOOA - ENT Professor at Escola Bahiana de Medicina e Saúde Pública - EBMSP (Medical School and Health Public Institution) - Head of Clinic Board at Hospital Santa Izabel - Santa Casa da Misericórdia - Bahia. 3. ENT doctor by ABORL-CCF - Preceptor at ENT Department at INOOA. 4. ENT Training Doctor at INOOA. 5. ENT Training Doctor at INOOA. 6. ENT doctor by ABORL-CCF - Collaborator Doctor at INOOA. This article was submitted to SGP (Sistema de Gestão de Publicações - Publication Management system) of R@IO on July 16th, 2006 (#137) and approved on October 12th, 2007.